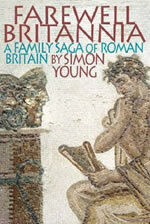 Farewell Britannia is a vivid, gripping account of life in Roman Britain by 33-year-old Roman and Dark Age historian Simon Young. A work of ‘fictionalised history’ it offers a series of well-crafted and entertaining stories based on archaeological and historical proofs: all carefully sourced at the book’s end. A family history, Farewell Britannia is written from the perspective of a fifth-century Romano-Briton, following on from the apocalyptic finale of Roman rule in the island. And, in the wrecked remains of his villa, this narrator recounts the experiences of 15 of his most interesting but not always his most respectable ancestors to give colour to the rapidly receding Roman past. The well-known events of Roman Britain are all here, of course: scouting for Caesar's expedition in 55 BC; the Roman invasion in 43 AD; Boudicca's revolt and the massacre of 70,000 Romans; the Pictish attacks on Hadrian's Wall; the infamous Barbarian Conspiracy of 367; and the departure of the legions in 410. But we also learn about some episodes not usually included by historians in their studies: druidic sacrifices in East Anglia; elephants in Essex; a desperate housewife cooking flamingo in Northumberland; headhunting in the Pennines; a bad poet in Londinium; suicide in Bath; infanticide in an English country garden at dusk; and martyrdom in an amphitheatre near Reading. "...this is no dry factual history disguised as a yarn. Young reveals each generation through a series of vignettes rich with insight...What makes this such a satisfying read is the real flavour it gives of everyday life...the greatest achievement of this magnificent work is its success in breathing life into real people." "This is a marvellous book, which beautifully captures the slowly-changing texture of Roman Britain, and brings us glimpses of what life was like. It is also, for those who know what came afterwards, unbearably poignant. Thoroughly recommended." "well written… of interest to fans of Roman and Ancient British History"
"Those who believe history is so, so dull might pick up Simon Young's new offering and have their view changed." "a hybrid, a combination of lively fiction and popular history… as educational as it is readable." "An ingenious way of creating a flowing history, supported with plenty of notes and explanations." 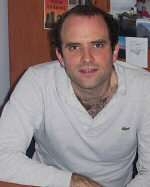 "Enthusiasts of Roman Britain will admire the virtuosity with which Young conjures new life into old bones. Other readers will simply enjoy the infancy of the island race, presented with such verve and immediacy. The past is another country, but it’s one whose realities Young reinvents with a rare combination of scholarship and imagination." "For imaginative and thrilling engagement with the history of those often shadowy and chaotic times, Farwell Britannia will be very hard to beat." "…fiction as written by a careful and formidably knowledgeable scholar, one who is concerned to ground all that he writes in scrupously documented fact…a book that, garlanded as it is, with a whle array of learned yet hugely entertaining notes, serves as a work of much more than simply fiction."